Williams Automotive Gain VACC Accreditation. 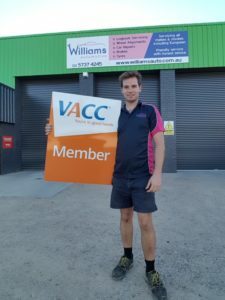 Williams Automotive are proud to announce to our customers that we have become a member of the Victorian Automobile Chamber of Commerce (VACC). This is great news for us and our customers. We can now say that we are backed by VACC’s professional support services – a great range of services on offer to us to help us grow and extend our learning further in this ever changing industry. Our customers will also reap the benefits of us being an accredited repairer by VACC including the reassurance of us being a reputable mechanic with the tools, experience and know how to service and repair your vehicles. Also we now have access to Australia’s largest automotive technical library so we can get more advanced technical information than ever before to help us in our diagnosis to rectifying your vehicle faults. A great day for Williams Automotive.